Teacher’s Pet is on the lookout for opportunities to give back to the community this year. ”We make a living by what we get. We make a life by what we give. In January, 2019, some of our Edmonton members got together and participated in the Meals That Mend Program. As a team, we prepared brunch for the guests at the Ronald MacDonald House Charities Alberta. Meals That Mend is a program that offers comforting meals to families staying at the RMHCA while their children receive treatment at the hospital. Volunteer groups can get involved by providing a meal for these families so that they can focus and invest their time on what really matters the most — their children’s health journey. Needless to say, this volunteer experience was very memorable and rewarding as we interacted with the families and were able to put smiles on their faces. Visit https://rmhcna.org/ to see how you can make a difference in your community. 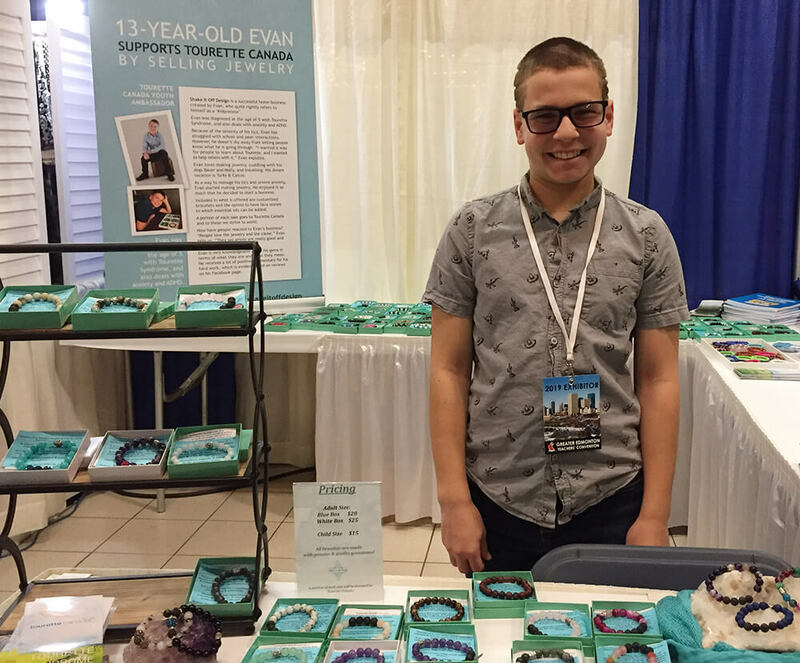 During the 2019 annual Greater Edmonton Teachers’ Convention, some of the Teacher’s Pet staff had the opportunity to meet a 13-year-old entrepreneur and philanthropist named Evan Robson. Although Evan is young, his personal jewellery business line has already made a positive impact on the lives of many others in his community. Let’s take a look at Evan’s success story and what he wants to share with the rest of you! Who is Evan and what does he do? Evan is the Creative Director and Owner of a fashionable jewellery line called Shake it Off Design that originated in Edmonton. He is also a Youth Ambassador of Tourette Canada. Evan handcrafts each bracelet that he sells using unique and rare beads. A portion of each sale is donated to Tourette Canada. His goal is to spread awareness about Tourette Syndrome to the public. The most inspiring thing about Evan’s initiative is his determination to help others even though he personally faces the challenges of Tourette Syndrome on a daily basis. Tourette Syndrome is a neurological disorder that is usually characterized by tics. Tics are uncontrollable movements or vocalizations. Some examples of tics include eyes blinking repeatedly, head rolling, shrieks, and/or clearing one’s throat. How does Evan control his tics? The majority of people who have Tourette Syndrome also have other challenges associated with it that may increase their involuntary movements. In Evan’s case, Evan also suffers from Irlen’s syndrome, anxiety and ADHD. He wears tinted glasses to help his brain process visual information. When Evan is anxious, his tics increase. Individuals who have Tourette Syndrome, or anxiety — in general, deal with it differently. Evan finds that cuddling or playing with his needy dogs, Bauer and Molly, helps him calm down. Swimming and taking cooking classes are also great activities that ease Evan’s stress. When required, Evan may take medication to help reduce his anxiety. Where did the idea of starting your own business come from and why jewellery? Making bracelets was quite challenging for Evan in the beginning, but luckily, he had a lot of support from his parents and sister. He started his journey to becoming an entrepreneur when his mom enrolled him in a bracelet making workshop. As his skills improved, his confidence also grew. Eventually, Evan worked his way up to selling his bracelets online. Where can people purchase bracelets? Evan sets up pop-up shops in and around the Edmonton area, as well as, at Farmer’s Markets. He also attends events like conferences, conventions, and various other community events when the opportunities arise. If there is something specific you are looking for, you can place custom orders through Evan’s social media accounts. 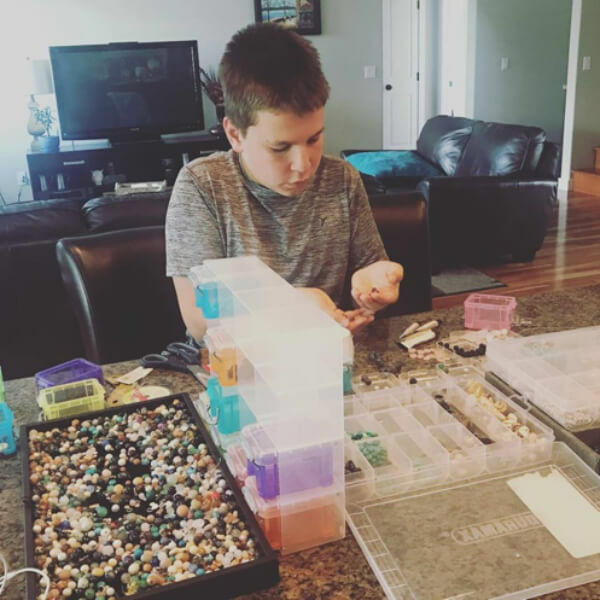 Currently, Evan sells an assortment of bracelets made from rare beads for men, women, and even children. What does Evan plan to do next with his business? 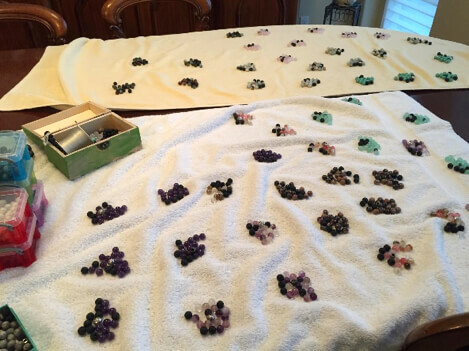 This young entrepreneur plans to continue building his jewelry line and start making necklaces, gemstone rings, and earrings in the near future. Evan also hopes to continue to expand his audience in regards to spreading awareness about Tourette Syndrome by speaking at more seminars and conferences. For more information and updates about Shake it Off Design, visit Evan’s social media accounts on Facebook & Instagram. Good luck in your future endeavors, Evan!